Making the Front Axle :: Go-kart powered by a lawnmower engine! 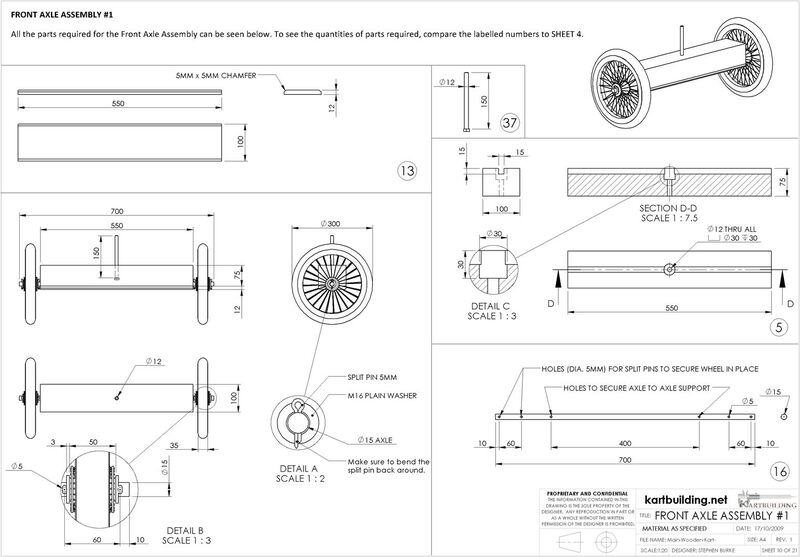 Below are the next 2 drawings from the total of 21 in this complete set of Kart Plans focusing on the front axle. 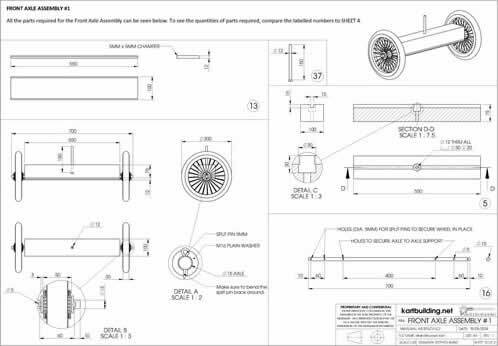 This drawing shows an overview of the complete Front Axle assembled together. It also shows each of the parts required, and the size of each part required. Drill a large 30mm (1 1/4") hole (you can get large diameter wooden drill bits called spade bits) 30mm deep into the timber on one side. Then drill a 12mm diameter (1/2") hole straight through the piece of timber. Finally remove the groove / slot using a saw and chisel. Removing the 15mm x 15mm groove / slot / trench will require a bit of work. It can be done by cutting several saw cuts along the length of the piece of timber and using a hammer (or mallet) and chisel. An electric skill saw can also be used. If the depth of the saw blade is set to 15mm, then 5 saw cuts can be made (with the width of the saw blade 3mm) which will fully remove this groove. A router can also be used if you know someone with one. The diameter 15mm steel bar is made from mild steel. You can buy this in a DIY store. You might also be able to salvage this steel bar from somewhere. 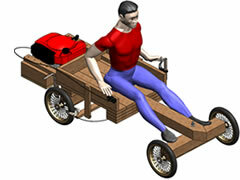 Make sure that the axle is indeed solid. Do not use tubing or pipe for this axle as it would be too weak. 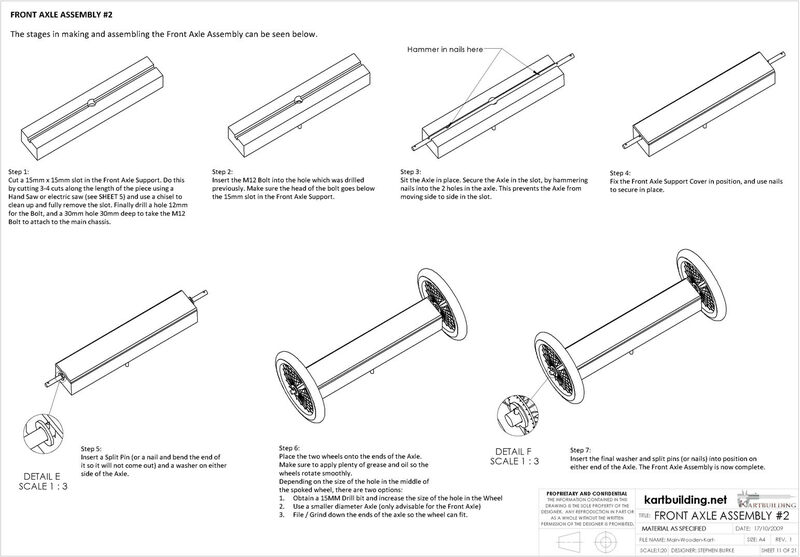 This drawing shows "step by step" how to assemble the Front Axle. Make sure to apply plenty of grease and oil to the ends of the Front Axle before fitting the front wheels and split pins as shown in Detail F. This will lubricate the parts, and allow the front wheels to spin freely and not wear away the material in the wheels or axle.